Skye-herd boss and lead animal practitioner at Healing Hooves in Alberta. Six years ago (2003) I came to Bella Coola, an isolated settlement of about 1800 (half of the population is First Nations) on the west coast of British Columbia (500k from the nearest stop light! ), to complete my Anthropology fieldwork for my MSocSc degree. I planned to stay only for 3 months before returning to New Zealand, where my husband and new home were. However, I fell immediately in love with this remote village, and was soon offered a 4-month contract with the General Hospital, which rapidly evolved into a permanent position. My husband joined me later that year, and soon found employment with the First Nations high school; we bought a property and began making our home in the valley. Unfortunately, in 2006 I lost my job, due to an economically driven restructuring of the United Church Health Services. In 2007, I moved without my husband to work at the Saskatchewan Population Health and Evaluation Research Unit at the University of Regina. After nine months of living away from my home, my husband and everything I loved—including this community—I quit my job and returned to Bella Coola, with a view to making myself useful to the community once again, while being supported by my husband’s wage. About two weeks after returning to my home, my husband was let go from his employment (a sudden decision made by the newly elected First Nations Government, which disrupted the school and dismantled the entire education authority). We were lucky that he managed to get temporary employment with the School District last year, which has held us over until now. However, after June 26th of 2009 we will both be unemployed, as the person he replaced last year has since returned to work. Because I love this community, I have been researching the needs and gaps in services with a view to once again making myself useful, employable and able to contribute to the community through paid employment in a meaningful way. While working for the United Church Health Services, I got the opportunity to see first hand the gaps in Social Services in our community. It is a remote First Nations community that struggles with a cycle and history of alcoholism and sexual abuse. One of the key gaps in service in our community, identified by the Social Health and Economic Development Society (an organization founded by myself and two colleagues to research and address gaps in social services in our community), is professional Drug and Alcohol Counseling service. Another critical need identified is qualified professionals with a specialization in autism. Bella Coola has a high rate per capita of autism, yet these people, in particular, have very limited support largely due to the small population and remote location; they often fall through the cracks entirely because of the limited, but strict, parameters issued by the Ministry. An intimate moment shared between two 'gents'. Realizing that I could fill some of these social service gaps, I have applied to take a Masters Degree in Counseling Psychology (scheduled to begin September, 2009). Instead of being a regular ‘talk therapist’, I plan to work with my farm animals as co-facilitators of the therapeutic process. I have been researching and learning about the exciting and burgeoning field of Animal Assisted Therapy and Counseling for several years, and have just completed my second level of Equine Facilitated Mental Health in Cremona, Alberta. In September, I will take the third (and final) level of the courses at Healing Hooves. These courses count as continuing education units for the Canadian Counseling Association, and together with the Counseling Psychology degree (and a host of other prerequisites) will lead to certification by Equine Facilitated Mental Health (with the Canadian Therapeutic Riding Association) and by Equine Facilitated Wellness Canada. My long-term vision is to provide effective counseling services, specializing in Animal Assisted Therapy, to foster recovery, healing and growth through a program delivered in partnership with animals where appropriate, as well as using nature as a therapeutic tool. In order to support my Animal Assisted Therapy career goals, I have developed a small hobby farm and have already taken in several animals with a history of abuse. I give them a safe environment to heal themselves and learn again to trust humans. From the experience I have had to date, along with the research into this burgeoning field, I know these animals’ stories will help me develop a rapport with the clients I plan to work with. Often, the trust between animal and therapist fosters the development of trust between client and therapist as well. Animals can also foster relationship with people who struggle in ‘normal’ social situations. Attachment is a basic need and drive of all human beings (and animals!). Everyone needs to feel a certain security in order that development proceeds as nature intended. This development is not guaranteed in humans, and animals can play a crucial role in rebuilding these relationships. Autistic people, in particular, respond to animals positively in a therapeutic environment. The Healing Hooves workshops will benefit anyone looking to explore incorporating animals into their therapeutic work. The workshop topics are covered through a mix of discussions, presentations, demonstrations and hands-on experiential exercises. They include opportunities to apply the theories learned to different client populations and scenarios through real life case studies, practice work with the horses, personal growth opportunities and interactions with Healing Hooves volunteers and former clients. Anyway, speaking of last weeks article brings me to the point of this weeks article. Matron asked me why did I grow Chard if I didn’t like it. Well…good question. And really, I have a good answer. Or at least I think it’s a good answer. Remember how over the last few years many of us have tried to “go local” with our food if only for a certain time of the year—say Thanksgiving or the summer? Whether local meant your yard, your city or within a say 200 mile radius, many more of us became familiar with that term. Of course some of us were already heading in that direction but with Micheal Pollen and Joel Salatin (and many other good writers and bloggers) talking more and more about our food, the term took on a greater meaning and understanding. Overall many more people became aware of the idea of eating locally and sustainable. Many of us also decided to add to the idea of trying to eat more locally by also trying to eat more “in season”–even if we had to purchase from a grocery store. Many of us began to say no to tomatoes and cucumbers in January. Of course…again to throw out someone well known…Elliot Coleman had really been pushing the envelope and teaching us about growing as much as we could, out of the “normal” season, and without a bit of supplemental energy, if we wanted to try and grow it ourselves instead of just buy it. Obviously if you are trying to eat local as often as you can, you will eat a bit more “in season” as the two are not easily separated. There are however times when that falls to the way side or becomes difficult considering the way we, meaning U.S citizens, are raised. I am sure other countries have this same issue but since I don’t live in those I will not comment on them. As an example of these difficulties I am speaking of I have to ask this question: why is the most common salad combination served basically lettuce and tomato? Most every restaurant has a “house salad” as a side and all of them include those two items. To anyone that has ever gardened however it is painfully obvious that lettuce and tomatoes do not grow at the same time. Well…maybe in Elliot Colemans yard they do, but I am sure we can all agree that that is probably more the exception than the the rule. I consider myself fairly experienced in gardening but without the investment of a really well placed and well made greenhouse—I will not get tomatoes and lettuce at the same time in my climate. So unless I make gardening and selling produce my living….no tomatoes and lettuce for me together in the same bowl. Unless the tomatoes are previously canned anyway. I could of course come up with many other examples of this type of out of season combos but I think that one stands out head and shoulders above the others. I am also sure there are a number of you that grew up with favorite recipes or meals that, in some form or fashion, incorporate food products that are grown during different seasons of the year. I know I was. Combinations that are not sustainable in the sense of local or in season. This makes learning how to eat local and seasonally quite difficult. Over the last few years as I have become much more serious about growing the majority of our own food I realize how many many recipes and cookbooks require pairings of foods that do not grow at the same time. It’s one thing to occasionally eat an avocado or banana but if every recipe needed one of those two things then I could never ever be completely self sufficient. Because unfortunately no matter how hard I try avocados and bananas will never grow in my climate—even with a greenhouse. I also know we probably won’t ever be 100% self sufficient….but I think you see where I am going with this. Also I believe, and this is just my opinion, that since the advent of fast food and t.v dinners we, as a society, have narrowed our food choices. Narrowed them down to the most easily grown commercial foods and combinations. Off with the heads of the rest!! All the time there are articles about how many heirloom seed varieties are lost each year and how many rare breed livestock animals there are. Why? Well, that would be because we eat pretty much the same thing across most of the world. News stories often talk about “ If rice fails this year blah blah number of people will starve in third world countries (or Asia or Africa…pick a place)”. But what about if chicken failed? Or beef? Or potatoes like the great Potato Famine in Ireland? Have you heard about the potential wheat problem (called Ug99)? If all I eat is the sum total of some wheat, green beans, black beans, tomatoes, some lettuce, kale, spinach, corn and the occasional potato along side my beef,pork or chicken then I could be in a serious load of trouble at some point. Now I am not saying “oh the world is doomed” kind of thing but hey…..if we all eat only 6 or 7 foods what are we going to do when one or two of them can’t be had?? There are a lot of people in this world eating those same 6 or 7 foods. And ouch! Some hungry people are going to be out there clamoring for the 5 or 6 that are left. For most of my adult life I have been a firm believer in the theory that if you don’t like a food you just haven’t eaten it in the right dish. Try try again is my motto. Until I find a way to like it. Now whatever it is may never be my favorite but if I have to eat it for some reason or it is the only thing available….I won’t be gagging it down or gacking it back up. Beyond that it also helps me to be polite when I am a guest at someone’s house. And yes..we are guests often… and we have had people comment to us on more than many occasions about how nice we are as guests because we are not picky and very easy to feed. Our children included. They too have been taught this. I am used to trying and eating things that don’t particularly hit my “favorite” button. However…I can do it because I have done it often enough. No big deal. I leave you with that story….and the challenge to try to find at least one recipe for the things you think you don’t like. And to never pile your peppers to the side of your plate at someone else’s house. We need to open our minds and our gardens to new ideas about food. It’s a good thing as Martha would say. It’s summer here in the states and most of us who are “not dabbling in normal” are very busy with the weeding, mulching, fertilizing, harvesting, canning, etc. on top of all the other regular chores we tackle on a daily basis. For many of us, myself included, its very hard to take a day off – a day to rest and rejuvenate. However, I’m learning that taking a day of rest every now and then is the best way to get more done when I return to my work. For me, a day of rest, means getting out into the woods in the form of a hike. While hiking can be hard work depending on the trail, it can also be a pleasant walk in the woods. A walk surrounded by the sounds and smells of nature that allows you to just get away from it all for just a little bit. Backpacker Magazine’s Find a Hike Database, lets you search by city, state, park, etc. I Love Parks – Has links to the state park services in all 50 states and does include a few international organizations as well. Once you find your own state, I’m willing to bet the opportunities abound. There’s always going to be work to do, its always going to feel like you’re neglecting your chores if you take just one day off. However; I’m willing to bet if you allow yourself just a bit of time to get outside and enjoy the woods, you’ll come back to your work more refreshed and you’ll have had a great time with friends and family too (if you take them along that is). 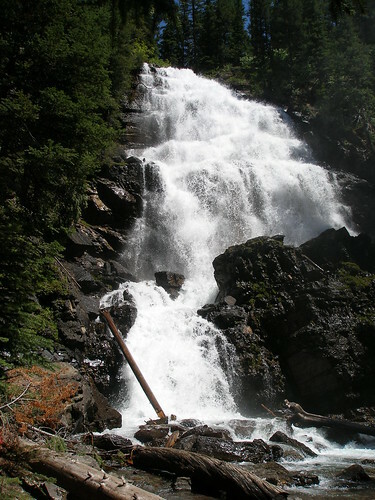 Morrell Falls, near Seeley Lake Montana (2.7 miles from Trailhead, a great day hike). It grew so quickly that I had to prop up the poor little immature plant with a brick because the pepper kept toppling it over! I know that the heat from the brick is probably know helping it right along with its amazing growth but the brick cannot explain why it started growing before all the other plants had even set flowers! This monster pepper is on a plant called the ‘healthy pepper’ which I started from seed…yes I would indeed say that is definitely ‘healthy’…and a little freaky too! Ready for winter gardening that is! I have a chart from Territorial Seed that tells me when to sow and transplant for fall, winter, and early spring harvest. I am determined that this year my garden harvest will not end with summer. No I want to harvest fresh produce year round. This is not only a nutritional decision but also and economic one. With organic produce having such a premium price in our small town it only makes sense for me to utilize the garden throughout the winter. Besides living in the very temperate Pacific Northwest gives me no excuse to not! Start sprouting broccoli and cabbage in the next couple of weeks for August and September planting out. I’m trying to figure out the best time to plant a fall sown crop of snap peas…maybe late August? I’m going to try a few new things like turnips and parsnips…and if I get really adventurous I might in plant some Kohlrabi, which I haven’t had since I was a kid! I know I will have to cover some of these crops for frost protection and others for pests…but I’m certain the little extra effort will pay off with healthy delicious produce directly from my garden during the cold days of winter! So…have you thought about a winter garden? If so what are you planting? And if you are a veteren, what tips and advice do you have for us beginners? Now that my winter garden is planned I’m going to go out and enjoy the first few days of summer with my little garden helper! I apologize for the shortness of this article…i dumped water into my keyboard and can’t use several keys. next month, i will go more in detail about the beauty side of herbs in the home. Herbs have been popping up on shelves everywhere, and not just for cooking. Lately, they have become more popular for treating illnesses and health problems and because they work so well without all the harsh side effects that can be obtained from their chemical cousins, it is easy to see why. Another aisle that herbs are gaining popularity is the Beauty Aisle. When so many reports of the alarming side effects mainstream products can cause, it is reassuring to know that herbs can be both beneficial and safe to use on a daily basis on our skin. Lavender: Helpful with acne, abscesses, allergies, athlete’s foot, dandruff, dermatitis, earache, eczema, insect bites and stings, scabies, sores, spots, sunburn and wounds. Use as a compress, a few drops in cleanser/moisturizer/toner or as a facial steam. May be applied directly to affected area (suggested to use a carrier oil such as jojoba or sesame as it helps to spread oil further as little is needed). Patchouli: It is effective for fungal and bacterial infection, insect bites, an insect repellant, has a great deodorizing action, assists with wound healing, a tissue regenerator which helps to stimulate the growth of new skin cells and in wound healing it not only promotes faster healing, but also helps to prevent ugly scarring when the wound heals. Also effective to sort out rough, cracked and overly dehydrated skin and is used to treat acne, acne, eczema, sores, ulcers, any fungal infections as well as scalp disorders. Peppermint: What a great energizing herb this one is! It’s a natural remedy for aches, pains and itches. The Food and Drug Administration has accepted Menthol as an effective topical treatment for pain and stiffness of joints and muscles. The oil cools the itch because it increases blood flow to the skin to reduce pain and discomfort. Peppermint can also invigorate the senses. Research in England has proved that peppermint successfully reduced daytime sleepiness. Look for peppermint in lip balms, foot salves, soaps and shampoos. Rose Geranium: Helpful to all skin types but especially dry skin. Add a few drops to boiling water for a facial steam, add a few drops to your moisturizer for face and body. This herb is also excellent for relaxing and calming the mind. Rosemary: Strong antiseptic. May be added sparingly to cleanser for use with oily skin to treat acne, greasy skin. Add a few drops to a tablespoon of jojoba oil and apply to scalp to help clear scalp and promote hair growth. Baking soda softens the bathwater and helps to soften and smooth the skin. It also has an alkalizing and deodorizing effect. Essential oils increase the therapeutic action. Place baking soda in a glass jar and add the essential oil drop by drop, stirring them in well. Tighten the lid and shake well. Add ¼ cup per bath. I wanted to write just a bit more about the tropical pumpkin vine that grew as a volunteer plant from seed next to our compost pile…the calabaza. Calabaza is in the gourd family and can function as both a summer and winter squash, depending upon the stage of harvest. It usually matures in 100-110 days, but there is now a variety with a shorter time till harvest. We’re really new to this, but enjoyed eating it from the ethnic markets nearby for some time now. It’s been fun for us to have one growing for ourselves this year, though, to try some hands-on and further the learning curve. In case you were wondering, although it’s a plant that’s considered sub-tropical, I’ve run across plant literature from states as far north as Massachusetts promoting it as a hardy crop in many areas for summer growing. It basically can be grown about anywhere pumpkins can. We have enjoyed watching ours mature, and it wasn’t until this past week that we had any problem with insect damage. Some sort of borer decided to have fun with them, but even so, we nabbed several undamaged ones, and are simply using the ones with some damage by salvaging the undamaged parts immediately. Until that point, they’d shown remarkable resistance to any sort of insect damage or maladies. In fact, we’re not convinced the borer damage was from squash vine borers, since it isn’t matching up to what we’ve read about them so far. Another blogger is helping us try to narrow it down so we can see what we’re working with (thanks, ~P!) But when it became clear we have some sort of critter on our hands trying to eat our calabazas before we could, we chose to go ahead and harvest what we had. We harvested 11 fruits from the one plant, ranging in size from 14 lbs to 6 lbs. This is such a wonderful multiple-use plant, I thought I’d show some of its versatility…quite a few delicious and nutritious things from the same plant. First, the blooms are edible. They are delicious battered and fried as fritters, or stuffed with cheeses and spreads. They can be chopped fine and added raw to salads, too, for a beautiful yellow color. We initially wanted to allow all our developing calabaza fruits to become as big as possible, but after we saw signs of borer damage, we harvested all the fruits regardless of size and we have a good range of harvested calabazas. We hope the undamaged larger ones will store well in a cool, dark closet. They pale over time, often from green to beige, as they are stored. Of course we are going ahead and using the young ones now. We’ve been harvesting these on and off, trying not to denude the plants, but the vines are so long (they are said to get as long as 50 feet per vine) there are still plenty to gather to eat for greens. We were excited to experiment with their use as greens. We do use them boiled or sauteed as we’d use most cooked garden greens, after slicing them thinly into a chiffonade. They aren’t bad, and have no bitter taste. I really enjoy them sauteed in a bit of olive oil. 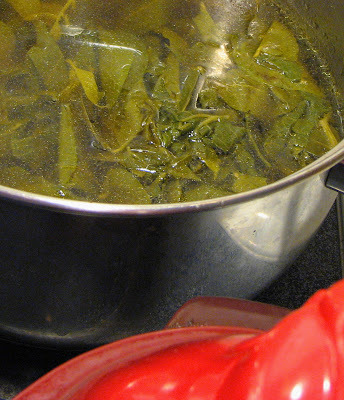 We also mix them with the other greens we gather from the purple hull cowpea plants. The mature calabazas are most like pumpkins or winter squashes, with a mild taste and stringless, nearly velvety texture when cooked. 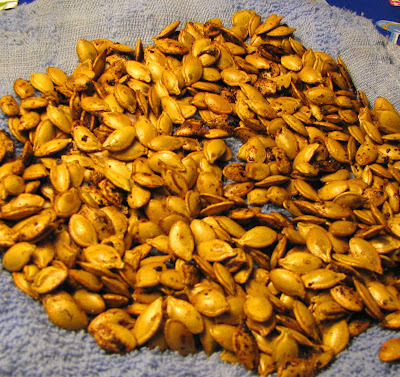 They can be baked halved, or even whole…roasted, boiled…however you’d cook a pumpkin. There is a slight, pleasant sweetness, but not as marked as a butternut squash. We’ve found it to be a very versatile pumpkin for use baked, roasted, in soups, and in baked goods such as cakes, breads, muffins, and pies. It makes a nice foil for savory dishes such as meats or beans, and so far has worked well for us if frozen for small periods of time, if cooked first. 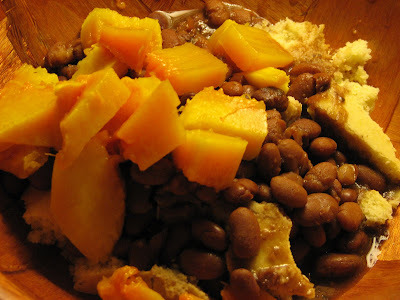 Below is one of our peasant meals of calabaza, beans, and cornbread. Its texture and flavor can go savory as well as sweet…delicious all by itself, or brushed with olive oil and roasted with rosemary and thyme…or made into a great squash butter with pumpkin pie spices and brown sugar or maple syrup…and so on and so on. It’s the base of Jack’s favorite soup, too (his most requested dish, ever, besides lamb curry)…almost a bisque rich with tubers and root veggies both blended and some left in chunks, in a rich broth made from the pan juices and stock from roasted turkey. 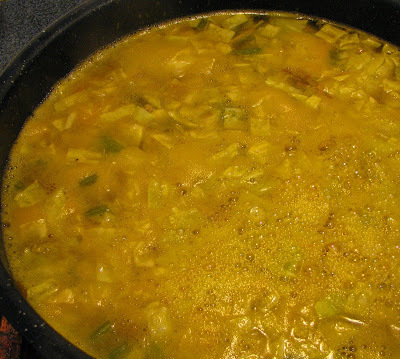 Below is a picture of the soup in progress, before blending and adding roasted calabaza chunks. And if that’s not use enough for one versatile plant, the seeds are wonderful roasted as well. They can be eaten whole, if roasted, and can be prepared with either savory or sweet spices for a great homemade snack. It’s too bad we had to do a hasty harvest, but even so, that one plant brought in over 90 lbs of food, not counting the leaves and blossoms…yay! I’m glad we tried it and found that in all its stages, it has really added so much bounty to our table. We have another calabaza growing on a different portion of our property, and anticipate always having one on hand to see how it fares in the different seasons here in Florida, with all its vagaries. We’re wondering if the timing of planting may have something to do with the stages of whatever insect did the recent damage.